These moves target the muscles needed for your fastest, strongest, best trail running outings ever, whether you're racing or just wanting to feel better on the trail. Trail running enlists different muscles than road running, which creates different needs for strengthening. The uneven nature of a trail, the ups and downs, and the challenges created by the varied terrain all call for different sources of power. Whether you're an elite-level trail runner, or someone who just likes to get out on the dirt once in a while, these five exercises recommended by Boulder, Colorado-based physical therapist and accomplished trail runner, Charlie Merrill, can make you stronger, faster, and more comfortable on the trail. Merrill recommends doing each of these moves two to three times a week, and stopping each exercise when good form is no longer being achieved, or to the point of fatigue, before moving on to the next set. HOW: Do this with a partner to help analyze your form, if possible. Stand with heels as wide as shoulders, toes pointing slightly out, and arms overhead, elbows locked. Squat down as low as you can, encouraging gluteal contraction, and keeping your back as straight as possible. If you can't do a full squat at first, hold on to something stationary at shoulder height. Start by doing three sets of 10 this way, and work up to doing three sets of 10 with your arms overhead. PAY-OFF: You'll notice yourself flying up large steps and steep climbs, and, your ability to do this movement well also predicts a much lower injury risk. WHY: Running is a series of jumps from one leg to another. There is never a time when both feet are on the ground at the same time (unless the hill is very steep or you are very tired and, therefore, walking). Each time you land, one leg absorbs multiple times your body weight at impact. So, small deviations in your biomechanical alignment can add up to big performance losses and even pain. HOW: Pay close attention to your form and use a mirror to monitor your alignment. Standing on one leg at time, keep your pelvis level, your spine vertical, and your knee tracking slightly wider than your foot. Initiate movement from your hip as you sit back into the squat. Your shoulders will lean forward a bit, but keep your back straight. Start off doing three sets of five, and work up to three sets of 10. PAY-OFF: When you can do these movements well, every step will be more predictable, more powerful, more accurate, and will propel you further with less chance of soft tissue strain. WHY: Trail running is a dance. Watching a runner negotiate a rocky trail without faltering is a beautiful sight. Graceful trail running requires excellent proprioception (a sense of where the body is in space), coordination of foot placement, and accuracy of each step. On the trail, our eyes are two to three steps ahead of our feet. That means our feet need to step where we looked seconds earlier. At that point, our eyes are already looking down the trail seconds into the future. So, learning how to "feel" where you are in space, rather than see it, is an important trail running skill. HOW: The starting stance is similar to that of the single-leg half squat. Stand on one leg, keeping your pelvis level, your spine vertical, and your knee tracking slightly to the outside of your foot. Start off standing on firm ground with five sets of 30-seconds per leg, and work up to five sets of 60-seconds per leg. Advance to an unstable surface, like a soft mat, inflated disc, or BOSU ball, first for five sets of 30-seconds per leg, then five sets of 60-seconds per leg. Advance to doing this on the unstable surface with your eyes closed, again for 30 seconds at first, then for 60 seconds. PAY-OFF: Doing most balance or agility exercises with your eyes closed can provide benefit to a runner hoping to improve trail agility and prevent dreaded ankle sprains. It will also help you negotiate technical sections faster. HOW: While most runners (and endurance athletes in general) avoid upper body strength like the plague for fear of lugging around a bunch of useless muscle, the reality is that our arms are a critical piece of our strength in running. This is especially true when running uphill or over technical terrain. The trunk and arms act as a counterbalance to our legs and also provide much needed power transfer down through our core to our legs. If you can gain strength in your upper body without gaining appreciable mass, you will be faster. The goal is to get functionally strong while staying light. Pull ups work your forearms/hands, biceps, posterior delts, lats, back muscles, and scapular and shoulder stabilizers with one exercise. Push ups, in turn work your triceps, anterior delts, pecs, abdominals, and scapular and shoulder stabilizers. HOW: Using a pull-up bar or assisted pull-up machine at the gym, place hands facing away from you. Tighten your abs to keep your back from arching too much. Focus on setting your shoulder blades down and together, and pull up so your chin is over the bar. Lower slowly, and repeat. Even starting off with just one pull up is beneficial. Work up to three sets to fatigue (as many as you can do). Three sets of 10 is a great goal for some. For push ups, start off on your knees, if necessary. Start fully extended through your elbows and reach with your shoulder blades so that your trunk lifts as far away from the ground as possible. Slowly lower until your nose touches the ground, then push up, remaining in a straight plank position. Do three sets to fatigue. Work up to three sets of 10, not on your knees. PAY-OFF: These two "old-school" exercises are an efficient way to improve your functional upper body strength. This will help you run with more balance, and faster, overall. WHY: Posture and flexibility of the upper body and trunk are often overlooked parts of a runner's performance plan. Strong, but relatively flexible legs can help your running. But you may not know that poor posture and stiffness in the upper body and trunk can translate into decreased breathing and lung capacity, poor core muscle function, and ultimately, performance losses below the waist in the legs. With a simple 6-inch foam roller, you can undo much of the damage caused by extended sitting, computer work, and years of slouching. HOW: Pectoral Stretch—Lie down so your head and hips are supported on the foam roller. Knees are bent with feet on the ground. Slide your arms up overhead, dragging your fingers along the ground. Stop at tight spots and hold. Thoracic Mobilization—Lie with the roller at your neck, and your feet on the floor with your legs bent. Support your head in your hands, and let your head drop back toward the floor. With hips just off the floor, push with your legs to roll out your back from your neck to halfway down your spine. PAY-OFF: Your running form will look better and be more efficient. And improved posture will help you feel better day-to-day. Plus, the bonus is that you'll likely set a PR up your favorite local peak, or in your next race. Special thanks to Charlie Merrill and Alta Physical Therapy of Boulder, Colorado, for this article. 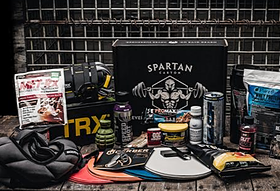 Snacks, Supps, and SWAG delivered monthly. New fitness products every month. 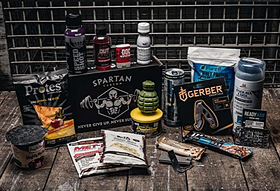 Gear Snacks Supps delivered Monthly. Our premium box offers not only snacks but the latest workout gear. 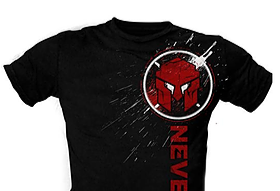 Show off your Spartan Spirit with the latest SWAG, hats, tees and water bottles.